At first glance one may wonder how qualified were the two young men who set off from a Texas border town bound for Mexico City in 1931. The author, a Yankee with an itchy foot, was hungry for a taste of peril. His companion, Robert Horiguichi, was the sophisticated son of an imperial Japanese diplomat. To say the two mismatched, would-be equestrian explorers were unprepared for the deserts, quicksand and brigands they encountered in the Mexican wilderness would be a mild understatement. Luckily before leaving the Lone Star state they had procured what they believed were the necessities, including a canteen, an old pistol and a typewriter to chronicle their adventures. Along with their mustangs, Pistole and Negra, the amateur adventurers set out to prove that the dangers of the road were as welcome as the pleasures - and far more satisfying. 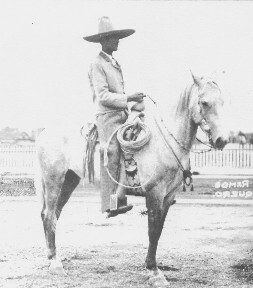 This is an excerpt from Goodwin's book, "Through Mexico on Horseback". Joe Goodwin and his best friend, Bob Horiguichi, believed they were ready for anything Mexico could throw at them - how wrong they were! Mexican bandits seem to function in epidemics. For weeks, months, even years, nothing is heard of them. Then, one day, comes report of a train robbed near Pachucha or Monterey. The next day a village is sacked down in Sonora, or a haciendado and his retainers are slain in the state of San Luis Potosi. From these isolated cases the contagion spreads and robbery, arson, murder and rapine ride on the hoofs of bandits’ ponies. Since the first days after the trail at Villa Acuna, Bob and I had heard only scattered warnings against brigands. And during the entire thirty-nine days it took our horses to plod the long route to Jilotepec, we had seen no one who threatened us any harm. We had come to feel that the whole thing was a popular myth, that there were no bandits in any of the towns through which we passed. In fact, we decided, if there were any outlaws in any part of the republic, they were probably tame compared to the “tough guys” in the United States. The warnings, we believed, came from persons who only feared the next village contained vicious individuals because the next village was too far away to be familiar, and unfamiliar things are fearful to primitive minds. Rumors of bandit activities had begun again at San Luis Potosi. There was labor trouble on the railroad in the north. A train was derailed. Nothing had been taken and no one was injured but shots had been fired at fleeing horsemen. News travels slowly in the ranch country. At Santa Domingo, Arroyo Zarco and Chichemecas there was no word of “los bandidios.” But the owner of Santo Domingo displayed a muscular forearm which had been torn by a bullet in a raid a few years earlier and the stucco walls of Chichemecas were as badly pitted as a pock-marked face. At San Juan del Rio and at San Luis de la Paz, tidings had seeped in of sanguinary raids on villages and haciendas in the mountains of eastern Hidalgo. In a cafe at Jilotepec, we heard that one band of brigands had been so brazen as to venture into the very heart of Mexico, practically under the noses of the soldados posted in all the towns surrounding the Federal District and the capital. Myth or no myth, the morning Bob and I left Jilotepec, we voiced our thanks for having been spared an encounter with the lawless. With few exceptions, our associations in the republic had been only the most pleasant. Now, with the ancient stronghold of the Aztec only seventy kilometers to the south, we felt that danger was past. Already we had run the gauntlet of the wild country. At any rate, we agreed, we appeared so much like poor, travel-weary natives that robbers would consider us unworthy of their efforts. Bob, with his combined European and Oriental inheritances, often had been mistaken for a Mexican and I, being a descendent of the “Black Irish” might pass as a native of Mexico if I were not too closely observed. The slow trip across the desert and mountain, under a tropical sun, had resulted in our being burned to a similar shade of mahogany brown. Our clothing, blue denim and khaki, boots and straw sombreros --- was bleached in spots, muddy in spots and ragged in entirety. Our horses, which had borne us over a thousand miles of the roughest country in the Mexican republic, were too emaciated and bedraggled to attract the covetous. Our general appearance had been planned from the very start as a measure of protection should we wander into the ken of outlaws. Nevertheless, one of us always carried the pistol given us by Senor Trevino, in a side pocket of his trousers during the day and under his head at night. We left Jilotepec on the morning of August fourth, the wet season was entering its final and most active half. The river, where we crossed over an ancient bridge at the pueblo’s end, was a sucking, swirling flood as thick as flowing lava. The sheets of water through which we had trudged the day before had ceased. But the atmosphere was so saturated it seemed to sweat large, cold drops that somehow found a way under the rubber cape draped from my throat, down over the saddle and below my boot tops. Every plant and native hut along the trail appeared to shrug its shoulders and hump over to keep out the dampness. A road had been started toward the city of Mexico, and Bob and I, heads ducked against the clammy breezes, turned our horses into the yellow quagmire. For hours we trudged along, climbing over high, muddy, ridges, sliding down into wide, muddy, valleys, skirting streams that had left their banks --- pushing on in hope of reaching the capital by night. About the middle of the day we entered a half-flooded valley north of Tepotzotlan. We were damp, hungry and generally uncomfortable. The horses dragged along through soft, black mud that reached to their knees. Before us in the distance was the bare, earthen-stepped hillside that climbs up to Tepotzotlan and Cuautitlan. Behind us, at a greater distance, were the green and slate-colored slopes over which our trail had led from Jilotepec. The entire valley, as far as we could see through the perspiring atmosphere, was uninhabited and deserted. But suddenly, there sounded the echo of a shout and a faraway flutter of laughter. A long survey of the road ahead revealed a moving patch of color, which in due time, spread to take the form of horsemen coming toward us. Soon we knew there were four of them and they all carried rifles. Even before we were able to discern their faces under the drooping brims of their sombreros, we had decided they were drunk. We looked for a way to go around them. But the heavy rains had flooded the flat lands on either side of us. Only the newly built road toward the capital was above water and it was knee deep in mud. “I don’t like the look of this,” said Bob and I agreed. “We had better meet them as calmly as possible though --- just as if we were old pals. Maybe they will think we are not worth stopping --- or maybe they are only going hunting,” he said and laughed nervously. I, too, was making a pretense of taking the entire matter lightly. I drew the pistol from my pocket and gripped it firmly, concealed by the folds of my rain cape. The four men had drawn nearer. Proximity revealed they also carried side arms. When we were within hailing distance they slowed their horses to a walk. They no longer talked or laughed. We continued at a steady pace, almost fearlessly. Three of them were facing us and the fourth turned his horse crossways in the road. A guitar was suspended about this neck, --- above a cartridge belt. He ran his fingers over the strings with studied carelessness. His attempt to maintain his Oriental stoicism failed. There was a new huskiness in his voice. Time and time again, Bob’s perfect command of Spanish had convinced persons, already deceived by his appearance, that he was a native Mexican. In addition to a faultless use of English, he conversed freely in his mother’s native French, his father’s Japanese, as well as German, Portuguese and Spanish. His linguistic ear was so delicately tuned that, as we passed through different states, he was able to alter his own expression and accent to conform to local dialects. “Buenas tardes, senores,” Bob addressed the waiting men. We were less than twenty steps away from them. There was a mumbled “buenas tardes” from one of the four. Their hands hovered near their belts. The carbines still were slung over their shoulders. We stopped immediately before them when the one who stood across our path gave no indication of moving to let us pass. Bob talked on, voicing various strained pleasantries concerning the weather. Three of the men began to edge their horses forward, two on one side of us, one on the other. I turned in the saddle to face the man behind Bob. My friend caught the movement and slid around to watch the man on my right flank. The third man dropped from his horse into the mud of the road. My horse, Pistole, became nervous and started twitching. Even Bob’s mount, the placid Negra, had his ears up and was chewing at the bit. The Mexican standing in the road asked for a match and stepped toward me. At that moment I caught a glimpse of steel in the hand of the brigand behind Bob. “Kick out your horse,” I screamed, spurring Pistole with both heels and firing the automatic twice in the face of the man who asked for a match. Bob, with all his seeming lack of suspicion, was completely alert and Negra leaped forward with the same movement that carried Pistole toward the man blocking our path. Again I fired twice, this time at the human obstacle before us. His horse reared, fanning with fore feet as Bob and I scurried past with heads low. I glanced up, still kicking Pistole and saw the bandit slash at Bob with a machete. Evidently my last two shots had gone wild. Bob meanwhile was cursing in French. In that tense moment it seemed ludicrous, --- my Japanese companion cursing Mexican bandits in French --- and I laughed, slightly hysterical, as we ran from the bullets that now began snapping at us and biting into the mud at the horses feet. The frightened animals plunged wildly through the deep mire. We were lying flat along their necks, spurring them at every jump. Long after we were safe, we continued running. When our assailants had stopped their wildly inaccurate firing and our hearts had ceased pumping like Gatling guns, we stopped to look back. Three of the bandits were standing in the road, looking down at a fourth who was lying in the mud. We did not go back to see if he was wounded or dead. We hurried on, forded a swollen stream and climbed across a hill of mud to reach Tepotzotlan, passing through fertile fields and orchards, peering back like pursued criminals and not pausing until we reached the village of Cuautitlan. I held up my cape for inspection. There were two neat round holes high up on the back. But despite our boasting, our laughter sputtered nervously like drops of rain in an open fire. “Through Mexico on Horseback” by Joe Goodwin is available on Horse Travel Books.